This is the first, Golden Age version of this Wonder Woman character. She appears in 1944, and makes her uncharacteristic return with Villainy, Inc. in 1948. There will be two later, different takes on the general concept with the Silver Age Giganta and the modern Giganta. This is the 1940s, so things are not exactly *consistent*. Her game stats, her height, etc. are very fuzzy since it changes from story to story. This version of Giganta likely existed on pre-Crisis Earth-2. 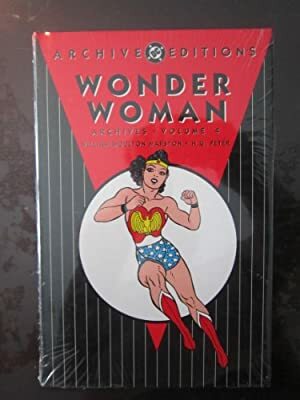 Giganta’s appearance in Wonder Woman #9 (Summer 1944) might have been inspired by the Paula DuPree character played by Acquanetta in 1943’s Captive Wild Woman , which spawned two sequels, 1944’s Jungle Woman and 1945’s Jungle Captive. That series, in turn, was supposed to have been *cough* inspired *cough* *cough* by Jacques Tourneur’s 1942 classic Cat People . Known Relatives: None, but she had a baby gorilla who died (back when she was a gorilla, obvs). Group Affiliation: Villainy, Inc. (pre-Crisis version). Base Of Operations: Washington, D.C. ; later Paul von Gunther’s secret lab, and later still Transformation Island. Giganta is very strong. She’s also quite tall and muscular. But those are 1940s stories, so… sometimes she’s 6’6” or so, sometimes she’s 5’8”. Sometimes her STR goes down to 04 and her DEX to 05, sometimes she has but a handful of Hero Points , etc.. And that’s *in the same issue*. Our DC Heroes RPG stats thus are a sort of collage from bits of the various stories. 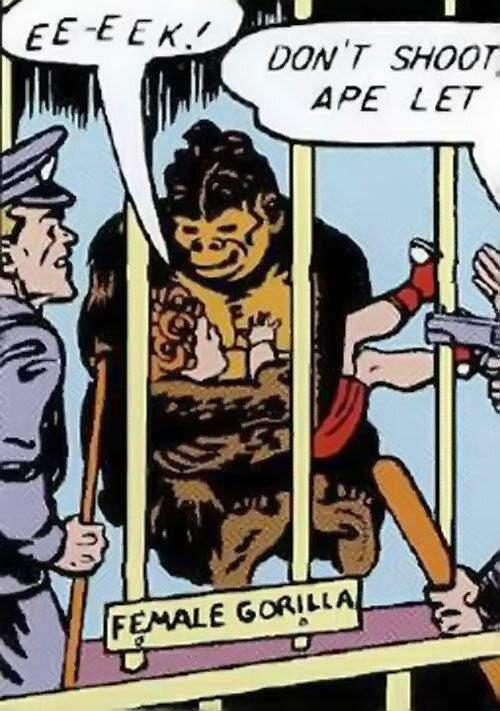 In the context of the story, all gorillas share a language (which Giganta still speaks). 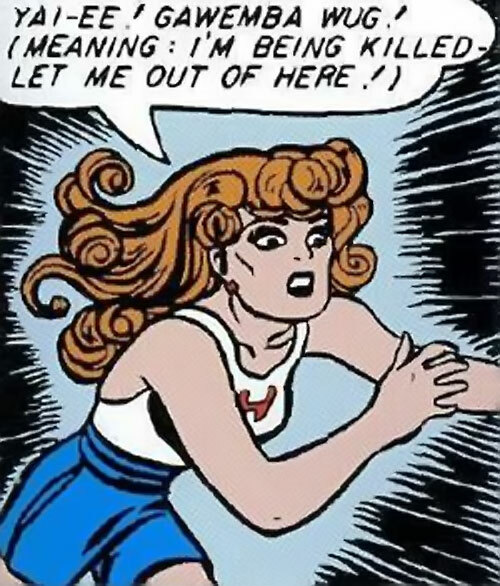 So do all prehistoric cave people (and Giganta also speaks that since she’s a gorilla girl, you see). At first she had a very primitive brain. But she later attained the full sapience of a modern human who doesn’t watch Jerry Springer. As a gorilla, she was amazingly strong. She could wrestle Wonder Woman for quite a while. In DC Heroes RPG terms she had maybe STR 10 and BODY 09, with Partial Attack Vulnerabilities (-2CS vs. bullets, – 1CS vs. blades). As the story begins Dotsie, Steve Trevor’s niece, carelessly gets too close to a zoo cage. She is thus grabbed by a female gorilla – the largest captive gorilla in the world. Having been moody since her baby died, the ape decides to adopt Dotsie instead. This sounds reasonable. As the zoo employees try to force her back, the gorilla tears out the bars of her cage, then flees into the forest. Wonder Woman tracks the maternally-driven primate to Holiday College, where Professor Zool is giving a lecture about his… peculiar branch of the evolutionary theory. The she-ape causes a ruckus and disperses the Holiday Girls who try to help Dotsie, but Wonder Woman finally subdues the beast. The authorities can’t decide whether the she-ape should be shot. But Professor Zool somehow convinces them to allow him to try his “electronic evolutioniser” on the gorilla. The weird technology works, and the ape is turned into a beautiful redhead of Amazonian proportions. The newly human female is dressed in Holiday College clothes, but soon runs away in terror. In the fray the electronic evolutioniser gets damaged. It then turns the evolutionary clock back on everything in a large chunk of the District of Columbia. Soon the land has become a prehistoric forest with volcanoes, cave people, mammoths, dinosaurs, etc.. It was a bit of a mess, I’m afraid to report. Steve Trevor, Wonder Woman, the prof and the Holiday Girls (plus Dotsie wielding an adorable club) all become cave people. Logically enough, they all go looking for a cave. The best one is already occupied by the redhead, whom we learn is called Giganta. 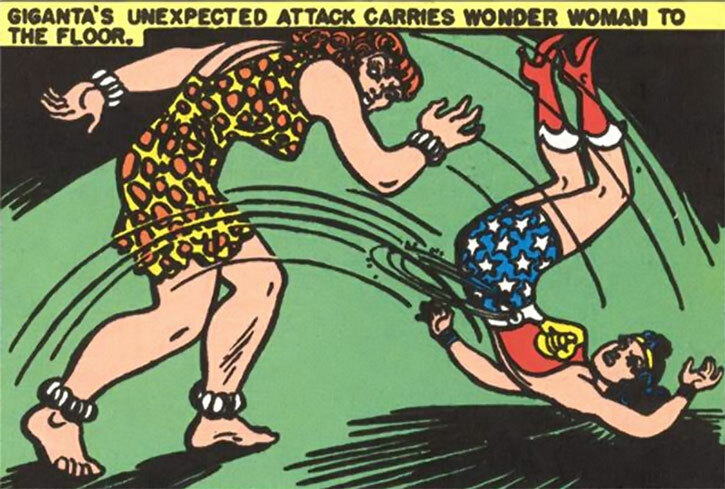 Wonder Cave Woman ousts her, and Giganta decides to join another tribe — one commanded by a male. 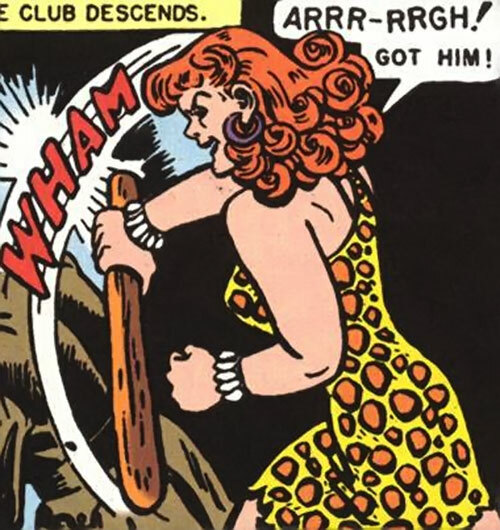 Allied with tree people (black guys who live in trees, and the sworn enemies of the cave people, who are white guys who live in caves), Giganta captures Wonder Cave Woman’s tribe. The tree people then offer them as sacrifice to a T-rex. Of course, the Amazon prevails, and later defeats Giganta when the former ape tries to ambush her. Wonder Woman repairs the electronic evolutioniser. Alas, it overloads and the entire area gets evolved into a perfect future world. Everybody looks like a model, except Giganta — though her mind has evolved too, and she is now as smart as a sapiens sapiens. The customs of the age force Wonder Woman to free Giganta, thus introducing her bestial evil in this paradise. 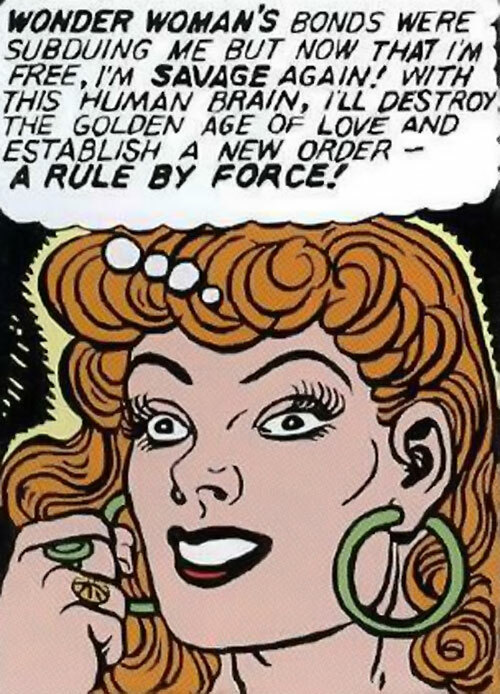 Giganta convinces the working classes to rebel (see ? True evil !). But the rebellion is stopped by Wonder Woman, and Giganta is bound again. Some days later she tinkers with the evolutioniser, and everybody is shot back to the age of the Classical Amazons. Though they are already ruled by Hippolyta, this is well before their exile to Paradise Island. In this new environment, Giganta captures Steve Trevor and claims him as husband. But he escapes and joins Wonder Woman in beating back Achilles and his Greek warriors. For boring chronological reasons, Xena and Gabrielle fail to make a guest appearance. Wonder Woman then uses the electronic evolutioniser one last time and everything is returned to its normal, 1944, state. However, Giganta is still a super-strong gorilla girl turned into a human with a modern brain. Oy, vey. A few months later it seemed that Giganta had returned and allied herself with some of Wonder Woman’s major enemies – Blakfu the ruler of the Mole People, the Duke of Deception, Queen Clea, Dr. Psycho and the Cheetah. However, it was all a ruse organised by an actor named Bedwin Footh. “Giganta” was but an actress. 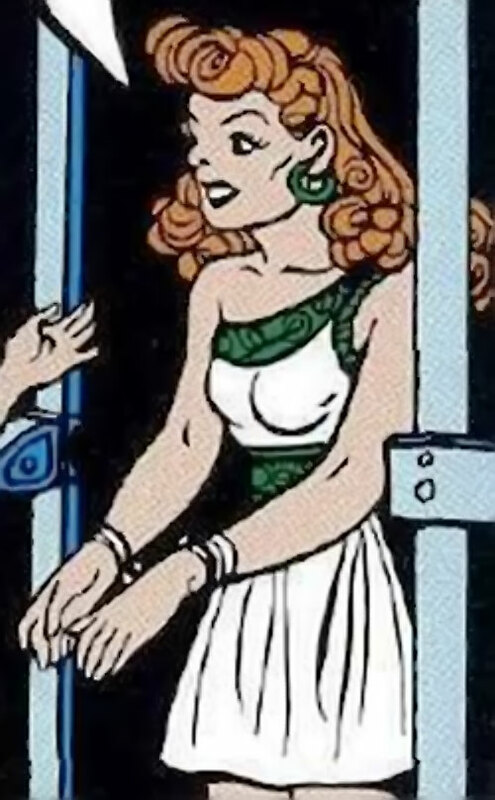 Interestingly, it is stated that the real Giganta is at that point “imprisoned in Paula’s secret lab for training”, presumably referring to Paula von Gunther. 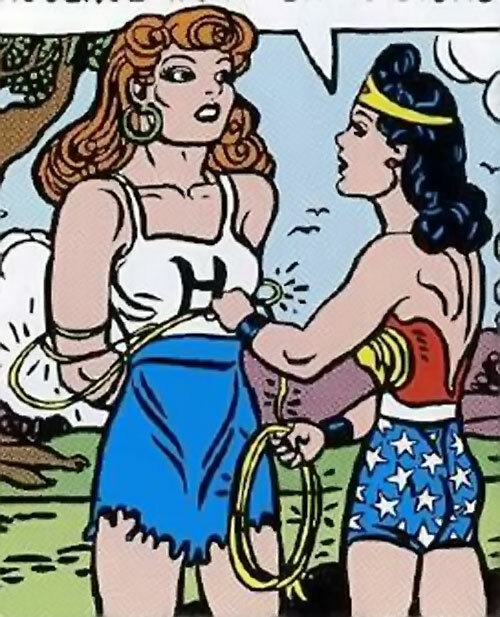 Since the Baroness had already been reformed by Wonder Woman and was basically an Amazon, one assumes that Giganta was being held at Transformation Island. 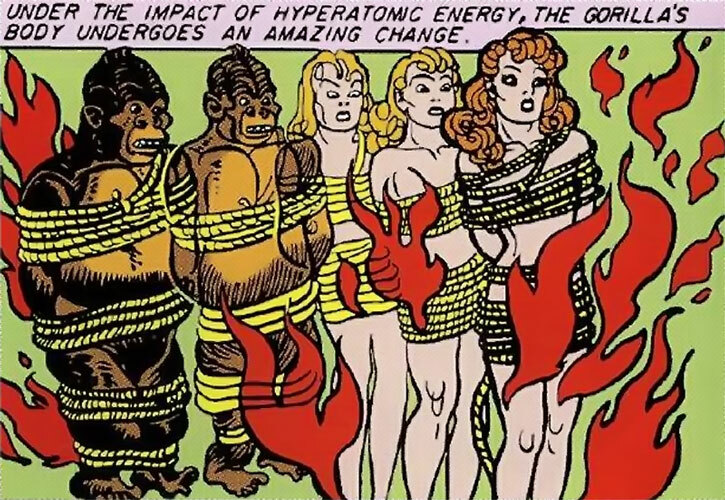 Giganta returned one last time in 1948 as a Villainy, Inc. member. She was one of the four who escaped the first defeat of the group – and she remained with Queen Clea as they tried to persuade the US government to sell them a submarine so Clea could attack Atlantis. They captured Steve Trevor – what else ? But their scheme nevertheless eventually failed at Wonder Woman’s hands. 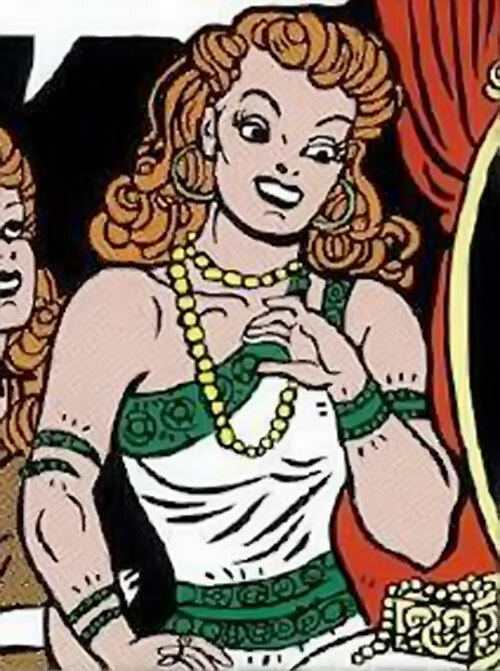 Giganta only wears the leopard skin loincloth and brassiere once – in her Villainy, Inc. appearance (though the actress hired by Footh wore a replica of those). This costume will be made famous decades later by the Super-Friends version of Giganta. She’s savage and mean, and only believes in force and the conquest of power. Yet she can also be manipulative and deceptive if simple force cannot carry the day. Int: 05 Wil: 03 Min: 04 Occupation : Threat or Menace? Language (Gorilla language, Cave people language). Chokehold, Close Attack 5, Defensive Roll 3, Power Attack, Takedown. Language 1 (Gorilla language, Cave people language). Acrobatics 3 (+7), Athletics 4 (+9), Deception 3 (+5), Insight 3 (+4), Perception 4 (+5), Persuasion 2 (+4), Stealth 4 (+8). Uplift Giganta spent most of her life as a gorilla, so there’s plenty she doesn’t know about mankind and the world… unless she turns out to magically understand things because she was turned into a human. Power lust Giganta wants conquest and power. She’s really mean and sees but weakness where nicer people see harmony. Trade-off areas. Attack/Effect PL 7, Dodge/Toughness PL 8, Parry/Toughness PL 9, Fort/Will PL 6. Points total 83. Abilities 40, Defences 19, Skills 12, Powers 0, Devices 0, Advantages 12. Equiv. PL 6. Source of Character: Golden Age DC Universe. 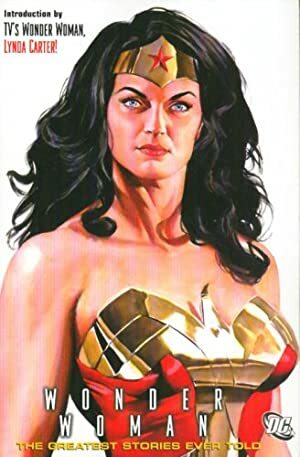 Helper(s): Dr. Sean MacDonald’s Wonder Woman (1942) WORG entry ; Darci.